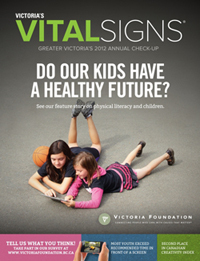 In October, the Victoria Foundation released Vital Signs, their annual check-up on the state of Greater Victoria's community. Again, their figures paint an image of a city where the average wages are lower than the cost of living, and homelessness is an issue. In our November show, the influential 20th-century playwright Bertolt Brecht gives us a funny and heartbreaking story of one woman's attempts to do right, and be a good person in a society where everyone is struggling to survive. Read on for more info on the director's inspiration for Good Person of Setzuan. Our wish for Victoria this fall is to take care of each other and keep striving for goodness in our imperfect world! It could be any city…any big international anywhere city. It could be Victoria. It is every city. In his classic parable play Good Person of Setzuan, Bertolt Brecht asks many difficult questions of his characters and of his audience. Why is it so hard to do the right thing… to be a good person? While developing his production for the Phoenix Theatre, director Conrad Alexandrowicz (seen left) couldn’t help but think, not only of those caught in the global economic crisis, but also of the poverty and homelessness in his own city. 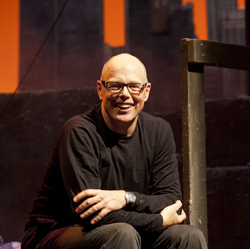 “I was curious to see how the philosophical questions and moral lessons of Brecht’s original translated to a world that has grown more thoroughly corporatized and materialistic than that of his day,” said Alexandrowicz, a professor in the theatre department who is also the Artistic Director of Wild Excursions Performance. “We live in one big globalized world now. Corporatized culture and branding in China is as similar to its effect in North America as it is in many places across the world. Now more than ever, this parable is universal and therefore, it could also happen here in Victoria. Brecht's play is as topical and poignant now as when it was written – if not more so. The trials of living in Victoria were recently recounted in the Vital Signs report (produced by the Victoria Foundation). It described a city where a “living wage” that keeps up with expenses should be $18.07 per hour, but the minimum wage is only $10.25. 11.3% of people in the region live in poverty and rental costs continue to increase – if, at 3% rental availability, you can find a suite available at all. Economic times are also tight in Brecht’s mythical city of Setzuan when three gods come in search of “one good person.” They are dismayed to find the search is so difficult. After seeking accommodation at many households, wealthy and otherwise, it is at the home of an impoverished young prostitute, Shen Te, that they find good will. However, Shen Te’s troubles really begin after a thank-you gift from the gods places her new-found status, new tobacco shop and her generosity in jeopardy and makes her an easy mark for theft, deceit and corruption. To avoid financial ruin, she re-invents herself as Shui Ta, a shrewd, no-nonsense male cousin to protect her business interests. “It’s an incredibly clever play,” said Alexandrowicz. “Brecht shows great depth in his understanding of the human condition and the way that different classes operate in a money-centric society." Alexandrowicz’s vision for the play is mirrored in the set designed by fourth year student Simon Farrow. It is dominated by a large panoramic skyline of a big “anywhere” international city that includes references to Shanghai (World Financial Centre), New York (the waterfront), Johannesburg (the designer’s home town), Kuala Lampur (Petronas Twin Towers), Dubai (Burj Dubai) and Soweto (Orlando Nuclear Towers). Recent MFA grad, Bryan Kenney's lighting design spotlights the action, including Brecht's many theatrical asides where the actors philosophize to the audience, and creates amazing coloured evening skies behind the row of skyliners. These corporate towers loom over a downtrodden slum that can magically transform from Shen Te’s tobacco shop, to Sandalmaker’s Lane, to a restaurant’s private dining room. The costumes for Setzuan's residents, designed by fourth-year student Kat Jeffery, also have a globalized inspiration, merging Western street style with a sense of Orientalism which seemingly channel the uniform-like style that became synonymous with China's communist revolution. The three gods, on the other hand, are colourful hybrids of many eastern deities. In a reference to growing corporatization, the Setzuan slum's characters all sport armbands that promote different international corporate brands. Third-year student Francis Melling has composed music to accompany Brecht's song lyrics in the play and is overseeing the music direction. "Francis is incredibly talented," says Alexandrowicz. "He's integrated Brecht's lyrics into contemporary pop music that will have you singing along by the end!" Same great show, just a public practice run the two days before we open. Preview tickets are made available to the public ONLY after 5pm on performance days. Reserve in person or charge by phone. It could happen in any city. It could be Victoria. Brecht's timeless parable play tells the humorous but heartbreaking story of Shen Te and her attempts to do the right thing and be a good person in a society where everyone is struggling just to survive. As topical and poignant today as when it was written! Subscribe and you could WIN books! Planning to come to Good Person of Setzuan? Consider upgrading to a season subscription and you'll see the remaining 2 shows in our 2012/13 season – Reasons to Be Pretty and You're a Good Man, Charlie Brown – for as little as $12. PLUS! 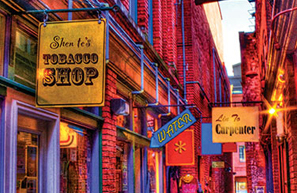 Upgrade on the night of your show and you will be entered to win a a book on the history of Victoria's Chinatown from Cadboro Bay Book Compay! Details at www.phoenixtheatres.ca. Order through the Phoenix Box Office by calling 250-721-8000 or fill out this easy subscription form. Intrepid Theatre’s YOU SHOW – an incubator program that provides project-based mentorship and performance space to emerging artists –includes two projects by UVic alumni. On January 23, Mika Laulainen (BFA ’12) presents The Runaway, a play about a young boy named Sam who runs away from home to live in the forest and convince passersby to help him save the world. On February 23 John Demmery Green (BFA ’12) presents To Make a Living, a riotous, unnerving black comedy of the supernatural and the 1%. To Make a Living is directed by Molly Noonan (BFA ’12). This is the fourth season of The YOU SHOW, originally created by Phoenix alumna Megan Newton (BFA ’05), has since presented 15 new plays-in-development. William Head on Stage's (WHOS) current production of The Hobbit, Tolkien’s classic hero’s journey adapted and directed by Kate Rubin, featured sessional instructor, Bronwyn Steinberg, and Monica Prendergast (MA Applied Theatre, PhD). Cam Culham (MA ’03), last seen on the Phoenix stage in Love Kills, and Romeo & Juliet will play the Doctor in Theatre Inconnu’s world premiere stage adaptation of Murray Gold’s Kafka: The Musical (November 28 – December 16). 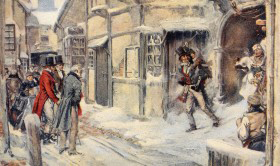 Jan Wood, Assistant Professor of Acting, will be appearing in the Belfry Theatre’s 2012 production of A Christmas Carol (November 13 – December 16). She will be playing Mrs. Fezziwig alongside her real-life husband and Victoria theatre mainstay Brian Linds who plays Mr. Fezziwig. This is only the third time that they have performed together in their history. Also appearing is theatre alumna Celine Stubel (BFA ’02), who plays Mrs. Cratchit and was last seen in the Belfry Theatre’s production of God of Carnage. Graduates both recent and bygone will lend their talents to Blue Bridge Repertory Theatre’s season opener, A Closer Walk with Patsy Cline. Patricia Reilly (BFA ’11) pulls double duty as set and costume designer, while Rebekah Johnson (BFA ’83, MFA ’10 in Visual Art) contributes lighting design. 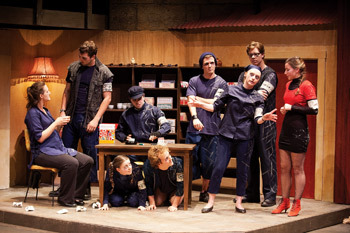 Blue Bridge has a history of giving Phoenix alumni the opportunity to work in professional productions. The summer season opened with Shirley Valentine, with Denay Amaral (BFA ’12) as the assistant stage manager. Arms and the Man had a set designed by Nathan Brown (BFA ’09) and included performances by current students Blair Moro and Kale Penny, as well as alumnus Mathew Coulson (BFA ’10). Of Mice and Men also featured lighting and costume design by Johnson and Reilly. 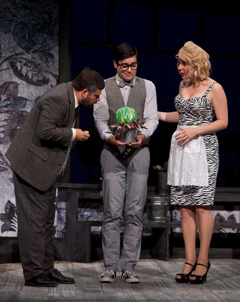 Little Shop of Horrors was directed by former student Jacob Richmond, featured choreography by Treena Stubel (BFA ’95) and performances by Kholby Wardell (BFA ’08) (show right in centre) and current fourth year, Kale Penny. 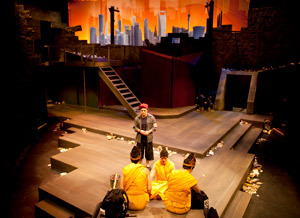 Win tickets to Good Person of Setzuan (November 8 - 24) at Phoenix Theatre. Answer the following question. Name three of the cities that are referenced in the skyline of the Phoenix's set for Setzuan. Correct answers will be entered into a draw for a pair of tickets! Email your answer before November 13th to win!